Judging from the statements of candidates like Senator Ted Cruz (R-TX) and Ben Carson, these evangelical voters display a lack of scientific literacy and rely on a literal reading of the Bible to interpret events occurring in the natural world. This supports the findings of surveys estimating the number of Americans relying on a Biblical interpretation of climate. CNN reported that 6 in 10 Americans believe extreme weather events are related to climate change, but "more than a third of Americans see recent extreme weather as a sign that the world is in biblical end times," and that "Thirty-six percent of Americans say that the severity of recent natural disasters indicate that we are at the precipice of Jesus' second coming and the end of the world. The survey found that 15 percent of Americans believe the world will end, as predicated in the book of Revelation, in their lifetime." If this 36 percent of Americans is located in midwestern and southern states, increasing scientific literacy and reducing the amount of Biblical literalism becomes an important part of the strategy in the battle against climate denialism in the U.S. Congress. Realistically, Bernie Sanders is not going to convince Ted Cruz about climate change with a few well-reasoned arguments. However, a first step may be to highlight places where scientific and religious understandings of the world can co-exist side by side. For example, the movie Noah directed by Darren Aronofsky had a nice scene which blended the traditional Biblical narrative of the seven days of creation with visuals that invoke geological and biological evolution. This mixing of religious and scientific understanding could sidestep the zero-sum game ("we're right and you're wrong") and allow both parties to begin a dialogue. Still, the movie was heavily criticized by Christian groups that are offended by anything other than a literal approach to the Bible. Is there any common ground to found between Biblical End Times and science-based climate doomsday scenarios? For instance, would a mashup of the mystical imagery of the Book of Revelation with the findings of climate scientists help motivate Evangelicals to reduce carbon emissions to avert the end of the world? Could Revelation's dramatic Apocalyptic battle between good and evil with its enigmatic "number of the beast" and seven Seals, Trumpets, and Bowls, be reinterpreted to warn us of the perils of methane clathrates and deep ocean anoxia? No, probably not. Even if the Lamb refers to this, and the Bowl refers to that, scientific knowledge and religious faith are still different ways of knowing about the world. Science is a process, based on evidence. Faith is premised on acceptance without evidence. Even if such cross-paradigm communication were possible, there remains the Book of Revelation's problematic motivation for God to want the world to end so He can smite the wicked and send the righteous up to eternal heaven. And secular humanists probably won't make the cut. "The Rapture" and End Times theology does not seem to support acting on the latest climate science, let alone putting a price on carbon. Creation myths and doomsday scenarios aside, climate change is utterly intertwined with ethics. For humans to survive, anthropocentrism is incompatible with the Anthropocene. We are all in this together. In that sense, the Paris Climate Agreement was a big step in the right direction. Many religious organizations already play a positive role in promoting climate solutions. Maybe Evangelicals could come on board by focusing on the social justice component of a carbon pricing system that returns funds back to people as a climate dividend. A basic income seems like something Jesus could have supported. In order to really understand what is happening to the planet, and to reverse their climate denial, they may need to step back from the Biblical version of the End Times. This may involve making the transition from viewing the Bible as literal truth to viewing it as an allegory. Readers of a metaphorical Bible may more easily accept scientific explanations for climate change, and then go on to support ethical solutions such as a universal basic income featuring climate dividends. 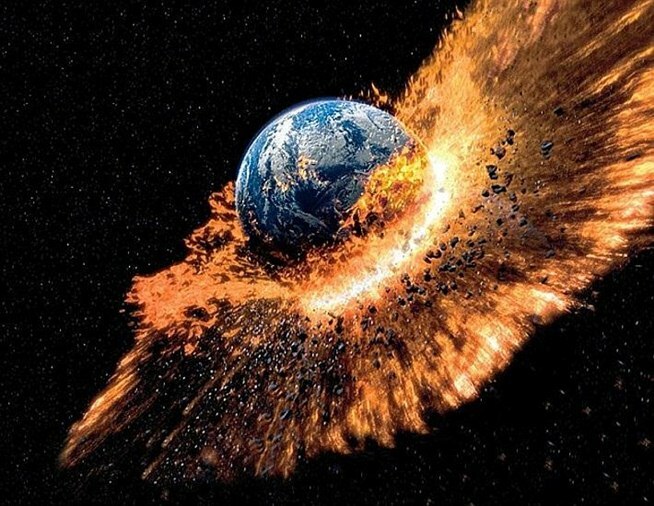 That may be heresy, but perhaps the only way for this segment of the population to stop blocking climate solutions is to begin adhering to doomsday scenarios backed up by the scientific method. Voters will have a choice in 2016 between candidates whose policy is based on literalism from the Bible, and those based on literalism in the latest IPCC reports. Choose wisely. Tell world governments: Keep 80% of fossil fuels in the ground.